The 2014 Formula Vee Challenge Cup Series ended on a high note at Watkins Glen International, with great racing and a fun, well attended awards ceremony. Saturday qualifying was wet, with Guy Bellingham taking the pole. That afternoon’s race was dry however and a five car pack consisting of Guy, Matt Clark, Arnie Carbaugh, Greg Davis and Trevor Miller battled back and forth over the entire race distance with Bellingham the eventual winner followed closely by Carbaugh, Clark, Miller and Rice. The awards banquet and ceremony followed that evening at Mura Bella’s Italian American Restaurant in Montour Falls. It proved to be a first class affair, with series title sponsor Complemar Partners Inc. generously covering all costs for the evening. The first through third place prize money for that day’s race was handed out and raffle prizes were awarded, with Ed Sanders and Dave Taylor’s names being drawn for the two Kearney Driver Development gift certificates. The last of the six Quixote Racing gift certificates were awarded and Ed Womer, builder and designer of the Womer Formula Vee, donated cash prizes, as well. The five top points’ finishers for the 2014 season were then handed their awards with Trina Carmody accepting the Series Championship trophy for her husband Ray Carmody (168 points). Unfortunately Ray could not attend because of commitments at the SCCA Run-Offs. Guy Bellingham followed closely with 154 points and garnered the second place trophy, Greg Davis, with 97 points came in third, Matt Clark earned 61 points for the fourth place hardware and Mark Farnham received the fifth place trophy with a 48 point total. The 2015 Challenge Cup season started off Sunday with beautiful autumn weather and a Vee-only morning race. With what could eventually prove to be a watershed moment for Vee racing in the Mid-Atlantic area, all but three of the fourteen car field started the race using the Falken radial tire set-up. Carbaugh took the top spot, but Vee rookie Trevor Carmody was very impressive. Carmody had not even driven one lap around the Glen until Saturday’s wet qualifying, and even though relegated to the back of the grid for Sunday’s race because of his rookie status, he managed to come in third, with the second fastest lap. Rice was the top finisher among the radial drivers. After the race the cars and drivers were grouped together for a photo session at the Glen winners circle with good camaraderie all around. Before breaking up for the long tow back home, all the drivers gathered around and gave a warm round of applause to welcome newcomer Trevor Carmody to the Formula Vee fold. 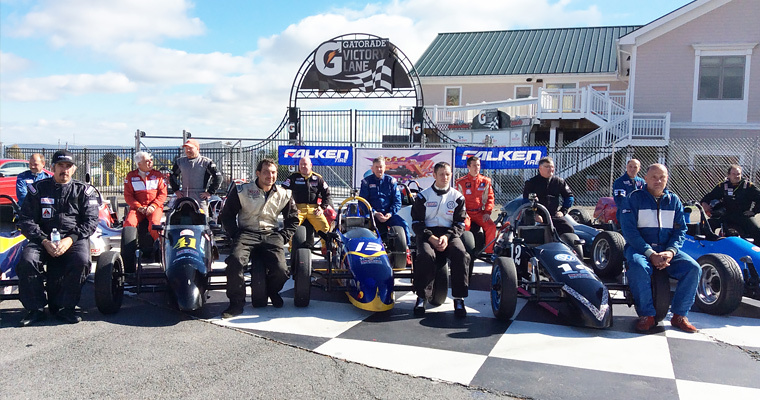 It was a fitting way to cap the completion of this year’s Formula Vee Challenge Cup Series.